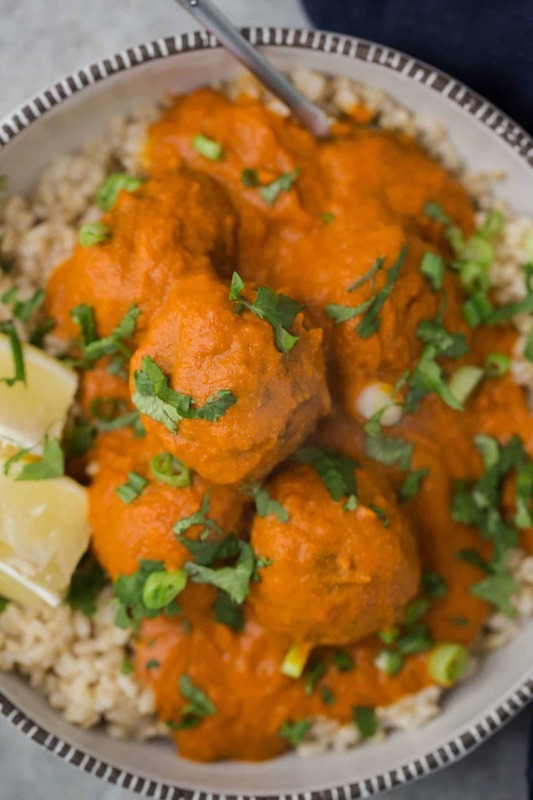 Curried Vegetarian Meatballs | Naturally. I am a magazine hoarder. It’s gotten better since I can now keep most magazines on my iPad but for the most part, I still love the tactile experience. When I was younger, I’d rip pages out of my mother’s food magazines to save and most of those pages are still in a binder I keep. It’s one of the many places from where I draw inspiration. This month’s Bon Appetit had a gem of a recipe for curried meatballs. I fell in love with the sauce before I even made it and knew it would be perfect with my favorite vegetarian meatballs. Turns out I was right. It’s a bit of prep but I think well worth it. The flavor of the sauce with the tenderness of the meatballs is my perfect meal. Combine lentils and water in a medium pot. Bring to a boil, reduce to a simmer, and cook until lentils are tender, 23 to 25 minutes. If lentils are not tender and water has been absorbed, add more water and continue to cook. Drain off any excess water. Heat olive oil in a skillet over medium-low heat and add the scallions, garlic and carrots, cooking and cook for 4 to 6 minutes until carrots are tender. In a food processor, combine the cooked lentils, onion mixture, nuts, panko, herbs, salt, and pepper. Pulse a few times to start combining the mixture. Crack the egg in and pulse a few more times until the mixture is combined but the lentils are still holding shape. Set aside and let rest while the oven preheats to 425˚ F.
I followed the recipe for the sauce closely except I left out the dried chiles as I was not looking for a spicy sauce. 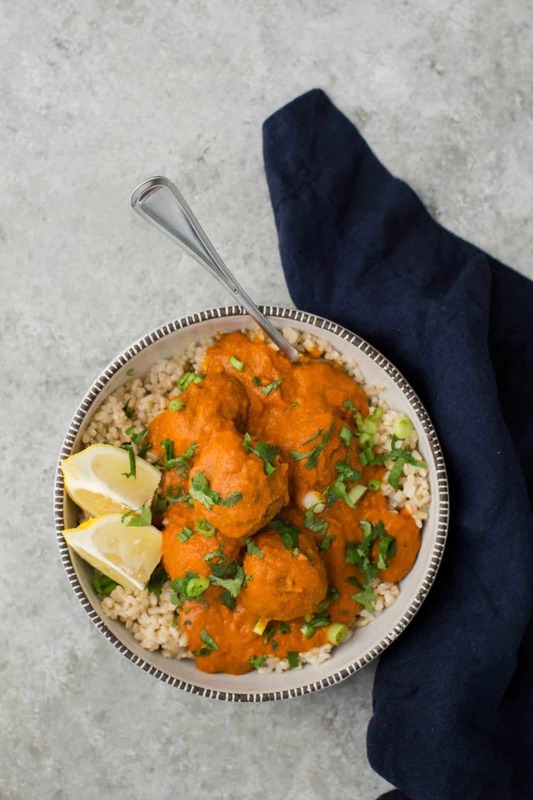 I didn’t mess with the sauce too much from the original recipe so really the variations are within the meatballs and the best ways to serve these vegetarian meatballs. vegan/gluten-free: If you’re looking to make these meatballs vegan, I recommend using 3 tablespoons water with 1 tablespoons flax seed. This helps bind the meatballs. And if you’re looking to make these gluten-free, you can simply use gluten-free bread crumbs. Grain: I served these over brown rice but millet or quinoa would be a great, quicker alternative. Toppings: I didn’t include this on my recipe but yogurt makes an excellent topping (especially if you use the dried chiles). Also, if cilantro isn’t your favorite, use parsley to top. This looks amazing! And I love the idea of making lentil meatballs — I’ve tried chickpea and they can bake up pretty dry. That sauce is such a gorgeous colour! This looks delicious!!! I would love to cook this but unfortunately I am allergic to nuts 🙁 Any suggestions of what I could substitute instead? Any seeds or vegetable? Hmm- I think you could try sunflower seeds or a mix of sunflower and pepitas. If you try it out- please let me know how it goes! This dish looks like something that my husband and I would enjoy. I’ve explored with more vegetarian recipes lately. Okay, these meatballs look amazing!! I’ve been craving Indian for the last few weeks and I bet these would be the perfect thing! I am a magazine hoarder too!! I can’t help but impulse buy them sometimes, and then I have too many to read. 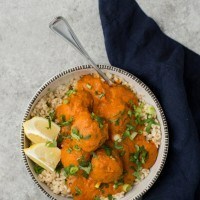 These veggie meatballs sound so delish, meatballs are one of the things I have missed the most since going veg years ago! Anything you can substitute the egg with? ahh, you’ve written flax seed, thaaanks! I swear I have like 100 magazines I’ve saved in my house. It’s ridiculous! But there are so many good recipes and inspiration inside the pages, I can’t throw them away. P.S. This recipe is a keeper for sure! Pinning! These sound great, and I love the vibrancy of the sauce. Love the idea of vegetarian meatballs! Yum! Would these work okay in soup? Could I freeze them for later? Would you suggest freezing before cooking them or after? Thank you! You are a lovely cook! Good questions! I’ll start with freezing- yes, I think they would work well to freeze. I think I would freeze them before cooking (freeze them on a tray then transfer to an airtight container to continue storing). As for soup- I’m not sure they would hold up in liquid for very long. It might be worth a try but I’m just not sure! Saw these yesterday and had all the ingredients. We enjoyed these very much last night! Thank you so much for sharing!! Shoot! I meant to click 5 stars!! Now I just been mother and I have to care my health. Interested in trying this out. Recipe instructions call for red onion but I don’t see that in the ingredient list. Can you clarify? Ah, last time I tested I switched to scallions and forgot to update the instructions. Fixed! I’m a magazine hoarder too. My husband hates it, but half of the meals I cook are inspired by the pages I stash. Great sounding recipe. Can’t wait to try it. At home I only have red lentils…could I use them instead of green ones? Hi Cristina, those are unfortunately the one lentil that wouldn’t work in this recipe. You need the lentils to keep their shape and red lentils get too soft/mushy! I think there is something wrong with the curry recipe. It’s missing something to make it “creamy” and light like in the picture. I went over everything and I can’t figure out what I missed. Could you please review this can fix it? Hi Lisa- I’m assuming you’re referring to the sauce recipe on BA’s site? It’s important to really puree it well (and sometimes for a while)- that’s one of the biggest parts of creating the smooth, silkiness. What did yours turn out like? I made this and it came out really dry. 🙁 Any tips for what I could have done wrong? What part came out dry? If the meatballs did, my guess is they might have been cooked too long.